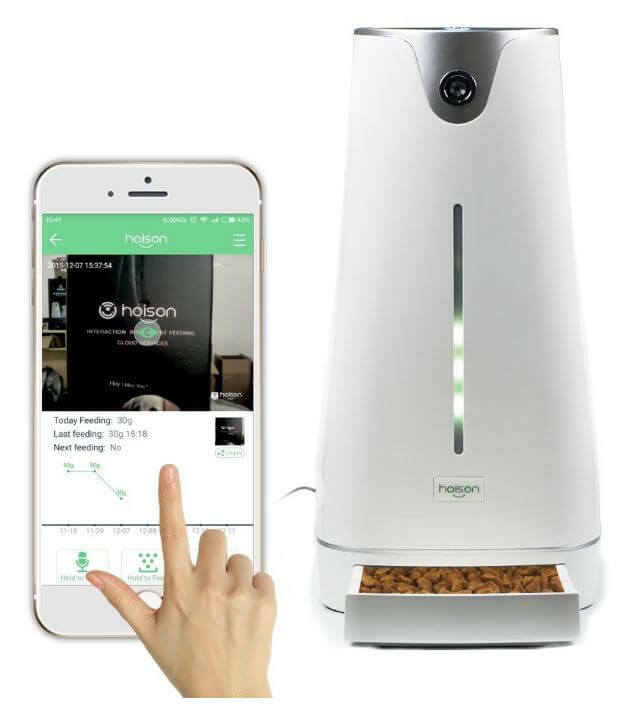 The Hoison Automatic pet feeder works with any smartphone including iPhones and other devices equipped with iOS. It also works with Android and Windows phones. You can control the feeder with your phone using the WeChat app. On an overnight business trip? Vacationing? Just busy at work and wanting to check in? The Hoison automatic pet feeder is more than just a food dispenser. 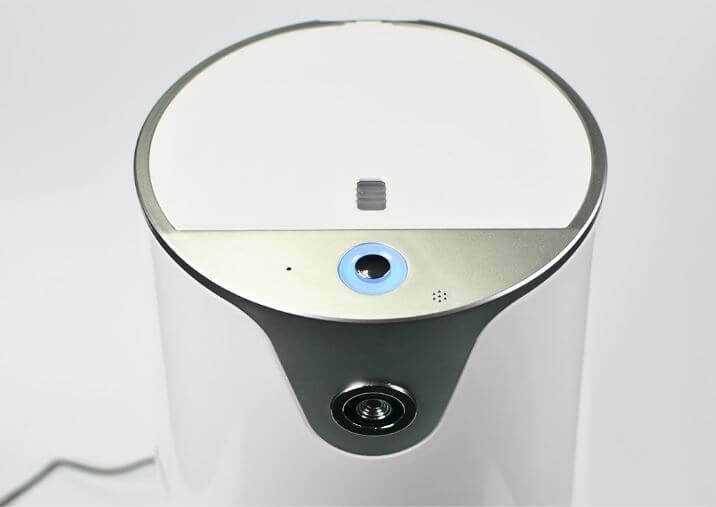 Thanks to a built-in HD camera and high-sensitivity microphone, it lets you interact with your pet in real time. You can say hello with voice call interaction, take your pet’s photo or video and save it to your device, or just watch him playing in the background. Pet sitters, friends, and family members can check in with your pet too, if you like. Just use the “More People Sharing” feature and let others enjoy the fun of bonding with your cat or small dog. The Hoison automatic pet feeder also lets you share your pet’s activity on your favorite social networks. Some automated pet feeders are purely utilitarian, both in function and appearance. Not the Hoison! This feeder features a modern design with an attractive, streamlined shape that complements any setting. A small 9.4” square footprint makes this feeder a good choice for smaller homes and apartments; and at just 19.7 inches high, it fits almost anywhere. An LED light lets you photograph and film your pet after dark. Activate it via the app to comfort your pet or get a better view of his activities. Besides allowing you to feed your pet manually anytime, the Hoison automatic pet feeder lets you program up to 4 scheduled feedings per day, and decide how much food to give your pet. The feeder is accurate to within 2 grams of weight, so you know your furry friend is getting just the right amount. This is ideal for pets that tend to overeat; you can satisfy their appetites and natural urges to nibble while portioning food out to ensure that they aren’t overeating. The Hoison automatic pet feeder is electric. No. It is sized for a cat or a small dog, and dispenses smaller portions than a large dog needs. 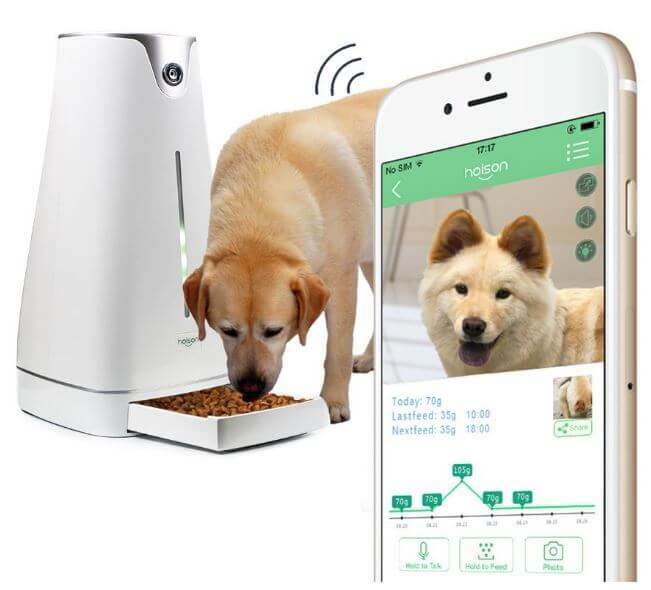 The Hoison automatic pet feeder is almost completely controlled via the app, so it’s really not suitable for someone who does not use a smartphone. No, there is no battery backup system. It’s a good idea to have a contingency plan for taking care of your pet when you’re not available. Yes, it holds enough food to feed the average cat for more than a week at a time. No. Clean the bowl by hand to prevent damage, and be sure to keep the electronics away from water sources to prevent damage. The Hoison automatic pet feeder is a fun alternative to standard food dispensers, giving you the opportunity to communicate with your small pet even when you’re away from home, and it lets you share with others, which is a fun and unique touch. Feeding can be completely automatic, or you can dispense food on demand, at the touch of a button. A small footprint and attractive design make this feeder just right for small homes and apartments. It holds enough food to feed your cat for a little more than a week, depending on his needs, and when combined with an automatic litter box and water fountain, it completely automates the process of caring for an indoor cat remotely at those times when you just can’t go home. 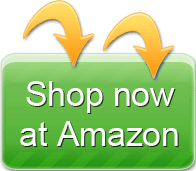 You can find the Hoison automatic pet feeder for sale at online retailers including Amazon. Hi! I’m Anne Kennedy, a nonfiction author, dedicated foodie, and contributor to Top 5 Reviews. I started contributing to this site in 2015 with the goal of helping others select quality home goods that help make busy lives easier. It’s interesting – and a lot of fun – to test things like bread machines, juicers, and of course coffee makers, learn what different models have to offer, and see how they compare with one another before passing my findings about the best ones on to you. Happy hunting!